While I’ve often complained that surgeries are not that useful I still do them. So if you want to be my first visitor in something like two years I’ll be manning the councillor surgery session in Battersea Library tomorrow (Saturday 21 August) from 10am to 11am. No appointment necessary, just show up. Like the Filipino politician (featured on the Independent‘s website) I can’t promise anything, but if you have any council related issues or problems I can try and help resolve them. If you can’t make it don’t worry, I’ll have a book to read and there are plenty of other, more convenient, ways to get in touch. Whilst initially I hoped someone would turn up tomorrow (no one likes being stood up) it seems from your previous posts and comments (+ more tellingly the fact that no one has ever attended) that the blog readers and residents agree with you, and would benefit more from proving you right. So I assume that the opposition to abandoning surgeries is coming from the council? So what can be done (and in true Big Society style what can residents do) to get the council to abandon them and enable better ways to communicate with and make use of councillors? If I’m honest I would have to say that we don’t have huge numbers contacting us in Shaftesbury. A big part is the nature of the ward: the two big drivers of casework are housing and planning, and because we don’t have large council estates and no real areas available for development these are relatively light. I think another part is the relatively low profile of local government, especially in London. When I look at my home town’s local paper on the web (it has a decent-ish quality, high circulation paid-for daily) council and councillor related stories are very high profile – people know that who’s running their local area because it’s in their evening paper. We don’t have that here, the Standard has bigger fish to fry and I’m not sure if the Guardian actually gets delivered anywhere anymore. A final factor is the council’s formal complaints procedure which I think is good, but doesn’t involve councillors – so if someone has an issue they are directed to a route that will probably resolve their problem, but will never come past us except as part of a statistical report. To give an idea of the sort of things I deal with I would say, off the top of my head, that the majority of my casework in my time as a councillor has been housing related, most often waiting list related (because the resident is over-crowded, has particular needs or has just been waiting a long time). The remainder comprise things like parking, anti-social behaviour, social services, lobbying – anything really. I’ve personally only dealt with a couple of planning matters over the years, partly because there haven’t been many, but also because planning isn’t a particular strength or interest of mine and we’ve tended to divvy things up between us to try and make sure the best person deals with them. Of course, to address your second point I would say just contact one of us (or me). 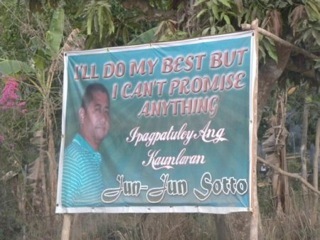 Nothing is too big or too small, although I will resort to the slogan of my Filipino counterpart and I won’t make promises. At the very worst I can deny any responsibility or point you in the right direction. The trickier question to answer is whether I get casework because of this blog or twitter, or anything else. On the one hand yes, for example of the half-dozen or so issues I’m dealing with at the moment I know at least two found me through this – but I don’t specifically ask people, so it might be more. On the other hand would they have contacted me or someone else anyway. My guess is that if they have managed to find this site they would have found contact details on the council website and it’s more a function of what their Googling throws up than anything.